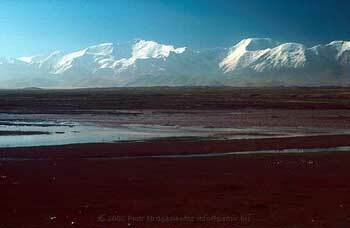 On the border with Kyrgyz and Tajikistan lies Peak Lenin and rises to a height of 7134m. Peak Lenin is accounted for as one of the less difficult 7000 plus mountains. If any attempt to climb a mountain, this one is ideal for a group of inexperienced climbers. Well not even climbers, but a group of enthusiasts that want to be on top of 7134 meters. At least we will be fit after biking the Pamir Highway , which will take us for 500 km above 4000 m. Actually it started a rest stop. Three months on bike and half way the Marco Polo tour. 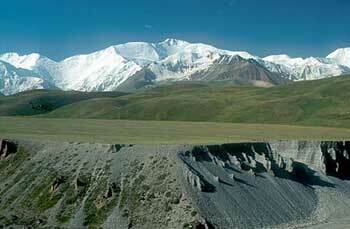 We will be ending the Pamir Highway by then and just before entering the great and vast China for the last long stretch. We wanted to plan a rest from biking and had a look what was possible in that region. 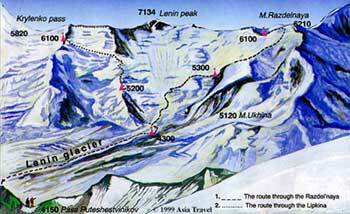 After some reading about the Pamir Range we found out about Peak Lenin. 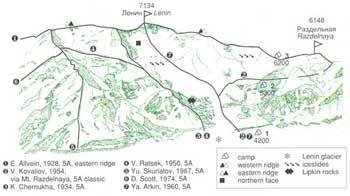 So our rest stop will be an attempt to reach the summit of Peak Lenin. To have a better chance in succeeding we arranged for the following: Clothing by The North Face and tents by MSR. They will be flown in via Bishkek. 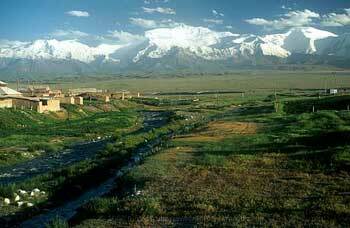 Tien Shan Travel Agency will help us with climbing gear, permits and accommodation in base camp. Last but not least, two local guides will drag us up to the top.